According to the National Health Profile released by the Health Ministry recently, Delhi has witnessed the highest number of diphtheria cases in 2014 out of a total of 4,071 cases in India. Also, 104 deaths in 2014 were reported due to diphtheria, while Delhi also had the highest number of deaths at 60. Diphtheria is a bacterial infection affecting the membranes of the throat and nose. Although it spreads easily, diphtheria can be prevented through vaccines. If left untreated, diphtheria can cause severe damage to kidneys, nervous system and heart. Haryana recorded the second highest diphtheria cases at 663. However, it was West Bengal that saw the second highest number of deaths at 10. Assam recorded the third highest figure of cases at 506, followed by Maharashtra at 444. In a separate news filed by PTI, Kerala has reported two cases of diphtheria though it had been eradicated completely from the state through vaccination and immunization programmes years ago. But the death of Ameeruddin, a 12 year-old-boy from Kondotty in Malappuram on September 17 had confirmed the return of diphtheria in the state, health department officials said. Health Minister V S Sivakumar said here today that the disease reappeared because of lack of immunization. “Northern districts Malappuram and Kasaragod are lagging behind in immunization in the state. 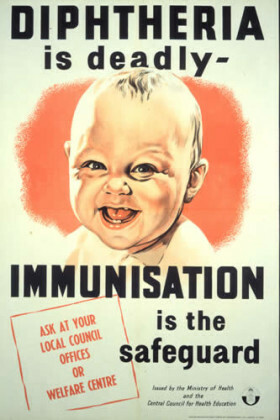 Unwillingness of parents had prevented health officials to administer vaccine to children there,” he said. He said it was unfortunate that the right of children to get immunized was denied due to superstition and false propaganda. The minister also said the department would initiate intense awareness programmes to make people understand the need to get their children take preventive vaccines. As part of the drive, the second phase of preventive vaccination programme would begin in Malappuram on October 1, he said. Minister for Industries and IT P K Kunhalikutty would inaugurate the programme, which is aimed at vaccinating all children below two years of age, he said. The reports of the return of diphtheria in Kerala, known for its high health indices and standard of living, has come as a shock to the state public health sector. The Indian Medical Association had termed the boy’s death as ‘shocking’ and ‘public health disaster’. Objective reporting after due investigation ( & talking to the concerned stakeholders) should be the principle of press reporting….In case of Delhi, the data fails to mention that more than 3/4th of the total admitted cases at IDH Kingsway Camp Delhi are actually from adjoining cities & towns of adjoining states ( as was personally established through data mining in 2012-13)…Diphtheria treatment facilities in most of the town on the boundaries of Delhi are abysmally poor or non existent forcing the hapless poor families coming here for saving the life…due to delay many lapse into complications resulting in higher deaths.. thus the news-report if read without these facts (context), can be seriously misleading… Since diphtheria affects the unimmunized, most of those who suffer even while being from Delhi are migrants & recent settlers with families coming form states with poor immunization services….